SALT LAKE CITY, Utah -- DigiTech has launched a newly redesigned website offering more product focused resources, improved navigation and more interactive content. Featuring individual areas on the website such as products, artists, community, and support section visitors can now more easily navigate through the site to find the information about the specific products they are interested in. New functionality on the site includes enhanced product information as well as a "Where To Buy" feature that links visitors to DigiTech retailers in their area. Links to DigiTech's Facebook page, Twitter account and YouTube page have also been added to the site as well as the ability for DigiTech users to register their products and sign up for regular emails, newsletters and new product announcements. "We designed the new DigiTech website with the goal of giving our loyal users a more comprehensive resource to our full line of products. We believe the improved functionality and new resources including the fully integrated social media element will be a great asset in keeping customers connected to the latest news on our guitar and vocal technologies," stated Rob Urry, Vice President and General Manager of HARMAN Professional Signal Processing Group. 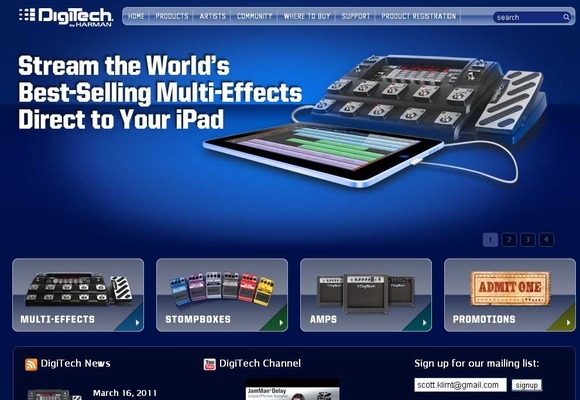 The new website is now live at www.digitech.com.